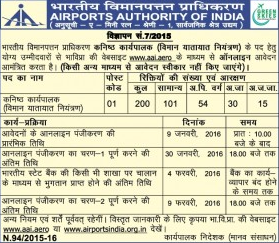 Airports Authority of India (AAI) is going to recruit 200 posts of Junior Executive (Air Traffic Control). Eligible and interested candidates can apply for this post before the last date of online registration. Last date for applying online is February 9, 2016. Candidates can apply for this post from the official website of AAI, www.aai.aero. Without waiting for the last date of online registration,candidates are advised to apply online as soon as they can. After the last date of online registration, authority will disable this recruitment’s link from its official website. Online registration for the post of Jr. Executive will starts from January 9, 2016. All category candidates have to pay Rs. 500 through system generated Challan at any branch of State Bank of India. Authority will not accept any other mode of payment. Selection will be made on the basis of Online examination, Voice Test and Personal Interview. The examination authority will not deduct any marks for any incorrect answer given by candidates in online test. The online test will generally be in conformity with the educational standards and/or technical qualifications prescribed for the post as per the syllabus available at the Link given under Careers tab of www.aai.aero.